AP Photo/Gail Burton Cynthia Pelayo left the tribute of roses and cognac, after the original "Poe toaster" didn't show up. 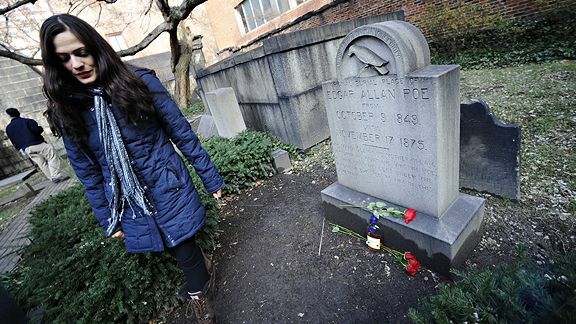 Fans of Edgar Allan Poe were left to wonder on Tuesday why the mysterious "Poe toaster" didn't leave the annual tribute of three roses and a half-bottle of cognac on the writer's grave in Baltimore -- a yearly tradition that coincides with Poe's birthday, Jan. 19, and dates back to at least 1949, i.e., nearly a half-century before Poe helped the Baltimore Ravens get their name. Baltimore has long claimed Poe as its favorite literary son. He was 40 years old when he died there in 1849 under mysterious circumstances, and his association with the city has grown over the years -- to the point that "The Raven" lends its name to the city's NFL team. Monday night and Tuesday morning, Poe fans from as far as Texas and Massachusetts passed the overnight hours reading aloud from his works, while waiting for the mysterious stranger to visit Poe's grave and pay his/her eccentric respects. But the person never appeared, and spectators were left to wonder why -- which is quite appropriate when it comes to Poe. "You've got so many possibilities," Jeff Jerome, curator of the Poe House and Museum, told The Associated Press before hazarding a few guesses. "The guy had the flu, accident, too many people." Or maybe the "Poe toaster" simply knew when a tradition had run its course. (Or perhaps the "Poe toaster" is a Ravens fan still ticked off about Saturday's loss to the Colts.) Either way, it's an end to an annual event that predated the 1958 NFL championship game between the Baltimore Colts and the New York Giants, the so-called Greatest Game Ever Played. It was a tradition that helped make Poe synonymous with Baltimore; so much so that Ray Lewis and Jonathan Ogden will someday enter the Hall of Fame as Baltimore Ravens. Football and poetry don't always go hand in hand, but in this case, they do.